Great campaigns are ones that drive sales. Zoho CRM helps your marketing teams create and run targeted campaigns, and pass on quality leads to Sales. Keep your marketing and sales efforts on the same page, and get the best ROI from every campaign created, with Zoho CRM's marketing automation tools. Knowing if a campaign is generating leads is important, but knowing if they're turning into sales is what makes the difference. With marketing attribution, get clear visibility on how much every touch point contributes to your conversion path. The touch point that initiates your lead's conversion journey or the final click on your CTA can describe your ROI the best—choose an attribution model that best suits your business. Zoho CRM gives you the power to run your campaigns from idea to execution. From sending out personalized and high-performing email campaigns to launching a webinar or survey campaign—create, send, and track campaigns that are specific to your business. 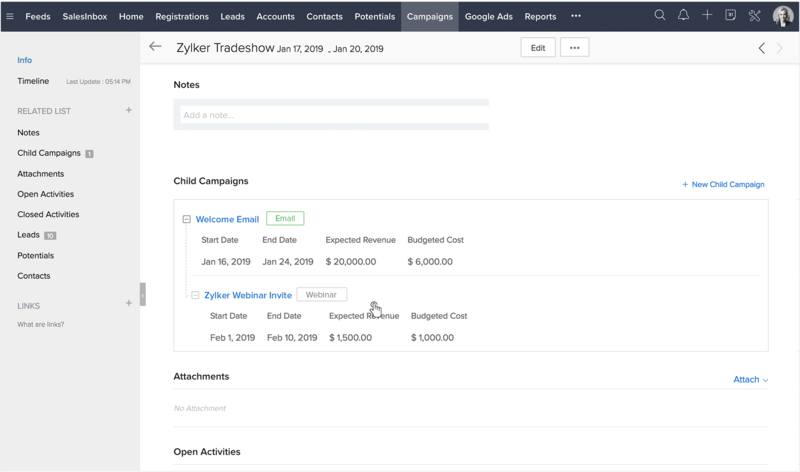 Set ownership of tasks, assign budgets, and measure the success of your campaigns, all from within Zoho CRM. Don't waste your time switching between your webinar and CRM interface. Zoho CRM works with Zoho webinars and other third party service providers to showcase your webinar campaign information in your CRM window. 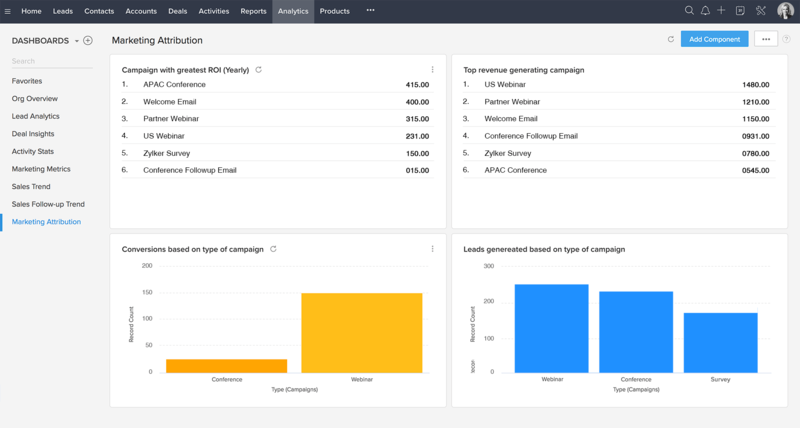 Set up your campaign with engagement polls, invite registrations with customized emails, measure it's performance, and more. We've brought your survey interface inside Zoho CRM, powered by Zoho Surveys. Create and send out objective surveys while also keeping an eye on how each of them is performing. When your prospects respond to a survey, add them as leads and associate follow-up actions that are timely, as well as effective. Zoho CRM combines your Google AdWords spending with your sales data, so you can figure out which campaigns, ads, or keywords are helping you convert leads to customers. Spend your dollars where they count and get a better return on your investment by targeting advertisements to your most profitable campaigns. Send out email campaigns that are targeted, yet personal, from Zoho CRM, powered by Zoho Campaigns. Choose from a range of pre-designed templates from our gallery or easily create one that suits your business. 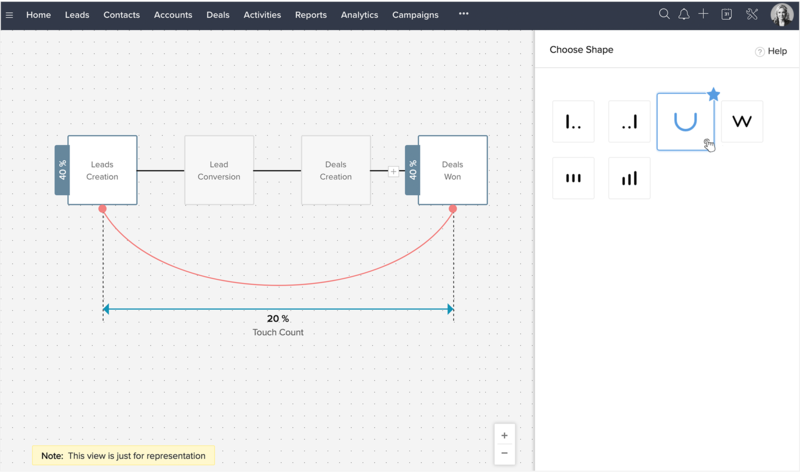 Associate drip campaigns, while also being able to track your email open rates, clicks, and bounces. Your campaigns can continuously improve when you know what's working and what's not. Find out your top revenue generating campaigns or the ones that need your immediate attention. Find out which campaigns contribute to particular stages of your deal conversion, like lead generation or deal closure. Measure better to improve, right from your CRM window. There are multiple campaigns behind a deal's closure and it's crucial to have visibility on each of them. Hierarchies in Zoho CRM help you do just that. Associate sub-campaigns to your main campaigns and see how each is performing. Send out a survey campaign to your trade show leads and schedule a webinar invite only to people who filled it out. Follow up contextually and track the campaign journey of your deals. When you have visitors on your landing page, web forms in Zoho CRM make sure to make every single one of them a lead. Build your forms with a simple drag-and-drop interface without the need for any coding expertise. Scan the business cards of your trade show leads and automatically push them as leads into Zoho CRM. Acknowledge them by associating follow-up emails, even before they leave your booth. 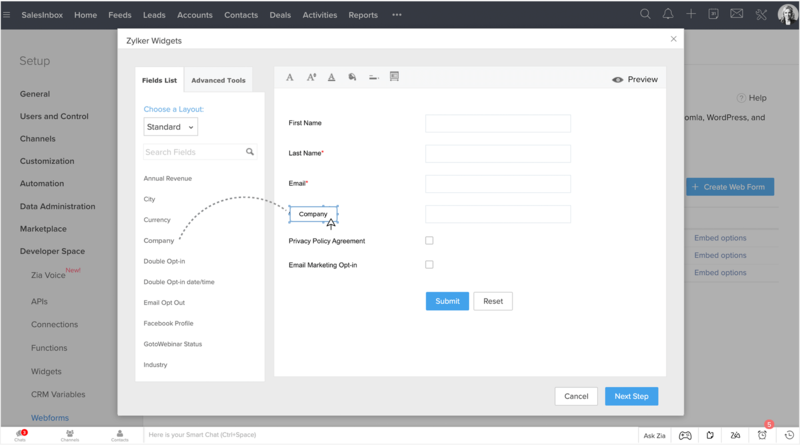 Zoho CRM works with popular marketing automation software like Zoho Campaigns, Unbounce, Constant Contact, GetResponse, and more, to help you make the most of your marketing investment. Zoho CRM gives you the tools to make smarter marketing investments.